5 Geeks. One Roundish Table. In this months GTRT, the Fandible crew talks about people we would love to Game With, NPC’s to PC’s, and the James Gunn Firing. 5 Geeks. One Roundish Table. This GTRT we talk about what we would change about our characters, challenging characters to play, and what we hate in RPG’s. 5 Geeks. One Roundish Table. With the coming of 2018, its time the fandible crew started this year right by answering your burning questions. 5 Geeks. One Roundish table. On this months Geeky Topics Round Table, we discuss monstrous transformations in games, murder mysteries in RPG’S, and our favorite monsters. 5 Geeks. One Roundish Table. On this Months GTRT, we discuss our feelings about being part of Fandible for the last 7 years and our plans for the future. 5 Geeks. One Roundish Table. 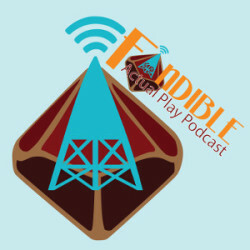 In this months episode, we discuss what games we would love to play, the best episode to introduce someone to Fandible, and our favorite apocalypse. GTRT Ep 34: The Game Discussion Episode. 5 Geeks. One Roundish Table. In this months Geeky Topics Round Table, we talk about Dexcon, Games we would run in a pinch, Games we know no one else would run, Games we would want to return too, characters we would have in a Vampire the Masquerade game, and Wonder Woman because it’s awesome.